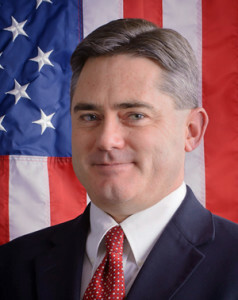 Senate Minority Leader Chris Holbert (R-Molasses). Republican leaders in the State Senate spent much of their morning on Tuesday in a Denver courtroom after suing Democrats for using computers to read the text of a 2,000-page bill last week; Sen. John Cooke (R-Weld County) requested a full reading of HB-1172 in an effort to bring Senate business to a standstill over the GOP’s inability to stop an oil and gas regulations bill (SB-181) from moving forward. It was estimated that reading the entire text of the bill out loud would take at least six hours to complete – during which time no Senate business could be conducted on the floor. Late Tuesday, a Denver judge ruled in favor of Republicans that computers cannot be used to read the text of bills at fast speeds, which is a minor victory for Republicans struggling to deal with their newfound impotence in state government. The implications of that ruling could be significant should Republicans decide to press their luck on this strategy. Republican lawmakers could ask for any legislation to be read in its entirety before business is conducted, which would devour most of the time in a legislative session that comes to a close in early May. After the hearing, Senate Minority Leader Chris Holbert (R-Parker) told 9NEWS political reporter Marshall Zelinger that this was the only tool Republicans had at their disposal in an effort to slow legislation. “Right now we have one party control of the legislature, and again, this is the one tool where we can raise our hand, as the minority, and say slow down,” he said. Before the final votes in the 2018 were even counted, Republicans were screeching “overreach” predictions about new Democratic majorities in the state legislature. There is a sad irony, then, that a political party obsessed with this singular narrative would be so blind about its own overreach. Instead of trying to negotiate with majority Democrats on important issues, Republicans have threatened recalls, inflamed calls for “secession,” and organized “sanctuary counties” by encouraging local governments to refuse to obey proposed gun safety measures. In their zeal to protect their oil & gas industry overlords from SB-181, Republican lawmakers have stalled and filibustered and demanded that Democrats drag out a process that already includes six different committee hearings and two floor discussions. Republican legislators are in the midst of a full-fledged political tantrum based on a bizarre and completely indefensible belief that Colorado voters want the GOP to stop the very party that they overwhelmingly elected just four months ago. In response, Democrats have no choice but to keep plugging along. You can’t negotiate with someone who won’t even show up to the table. Ok, so read the damn stuff. And when time runs out in May, the governor can call a special session during which everything that died would be reintroduced and will be read – at length upon introduction – and with any luck, they will finish by Labor Day. Then the finger pointing on each side: Why can't the Dems complete their work within the 120-day regular session? Why can't the Republicans refrain acting like assholes and playing delaying games during the regular session? Each side's base will be inflamed and life will go on. Yeah, the GOPers are acting like assholes (surpriiise!!? ), but the Dems are looking like fools. Leadership (. . . Hello?, is there anybody out there? . . . ) needs to get their act together, pare down and prioritize their agenda to the essentials, and get on with gettin’ on. There’ll be plenty of time for pointing fingers, bitching, and whining after May about why the lemonade stand bill never got heard . . .
. . . please, please just pass the gawddam budget and send the toddlers back home to their local kindercare centers. Leaders can only do so much. I griped about the timing of allowing a 2000-page bill to reach the floor at an important time, but leaders can't just "pare down" the bill list – legislators have the right to introduce bills, and even if Democrats were to sacrifice that right, Republicans still can – and then they can ask for a reading. Let's just hope we reach late bill stage where this becomes harder, before Republicans realize just how much gumming up they could really do with this process. Forget the Kindercare centers. They need to be grounded for life. Parliamentary procedure would allow a majority to "suspend the rule" requiring reading. Anyone want to clarify why that couldn't happen in the Colorado legislature? It’s not a rule John, it’s a constitutional requirement. From the judge’s ruling . The General Assembly is comprised of two houses: Colorado’s House of Representatives and Senate. Since its drafting and adoption, article V has specified requirements for subjects ranging from the qualification of Members of the General Assembly to when Laws passed by the General Assembly generally take effect. See Colorado Const. art. V, §§ 4 and 19. Every bill shall be read by title when introduced, and at length on two different days in each house; provided, however, any reading at length may be dispensed with upon unanimous consent of the members present. All substantial amendments made thereto shall be printed for the use of the members before the final vote is taken on the bill, and no bill shall become a law except by a vote of the majority of all members elected to each house taken on two separate days in each house, nor unless upon its final passage the vote be taken by ayes and noes and the names of those voting be entered on the journal. a law, the law so enacted is invalid. I’m using an iphone today. The usual “reply box” appears after I click the “Reply” button, but I am unable to type anything into the “reply box”?? I can speak at about 5x the normal speed (I've had to teach myself to slow down). I'm guessing there's others that can do this too. Why not get someone who can do this to read it out super-fast. It's a pain to go through, but it reduces the delay they are causing. Alva – posting from Android 8.0.0, Dec 1, 2018; Chrome 72.0.3626.121. I can on initial page load put in a new comment thread, but can't reply to other comments. Once I try to reply and cancel, I can't even add a new comment. My Macbook computer running Firefox works as well with Pols as it ever did, although a couple of times it showed posts in source, without pressing the source button, which was weird. Ipad seems to be working OK.